Dive back into the world of MICHAEL TURNER’S FATHOM! Aspen Matthews, along with her longtime friend and journalist Tyler, and their pet bulldog Matilda, discover that Aspen’s newfound celebrity status comes with a cost-and that price includes a visit from the S.W.A.T. team at their front door! Diplomatic relations between two nations can be difficult to maintain under the best of circumstances. With differences in culture and belief systems, global distances (although that’s becoming less of a concern as the internet takes over the world), and societal bias in play, it’s a wonder when two people of different backgrounds can find a piece of common ground to stand on. When one of those hypothetical people is from the Texas panhandle and the other from Muria, home city of the Blue and located at the bottom of the Pacific Ocean, the art of diplomacy becomes exponentially more difficult to hold onto. This third issue in the brand new arc featuring the fan-favorite creation of Michael Turner, Fathom (aka: Aspen Matthews… yeah, the publisher is named after the character!) shows how complicated the life of a super-powered member of an underwater race called the Blue can be. While Aspen would be perfectly happy to live a quiet life on the surface with her roommate Tyler and their bulldog Matilda, recent events have made that impossible. 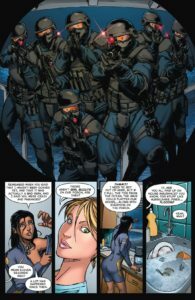 An attack against the surface by an offshoot of the Blue, a violent and aggressive faction calling themselves the Typhos, has thrown Aspen into the public eye. Not only was she seen fighting off the attack with all of the powers at her disposal, and winning, but her identity was blurted out for anyone with a smart phone to capture. The footage is trending all over social media, resulting in Aspen becoming a “person of interest” (damn, I miss that show… sorry, got off track). With nowhere else to go, Aspen takes Tyler and Matilda down into the Blue’s seat of power, the city of Muria, where their arrival is met with mixed emotions. Siphon, a high ranking member of the Blue’s Elite Council, supports Aspen in her bid to hold onto her human ties. He grants the three (even Matilida) asylum until more long-term accommodations can be found. His fellow council member Virydis is a little less welcoming. She believes that Aspen’s reckless behavior has led the Blue into a situation that they can’t just walk away from. The surface world knows about their existence, and while a treaty has been made between them, Virydis believes that it’s only a matter of time until Aspen’s brazen activities further undermine the security of the Blue. I haven’t read Fathom for quite some time. In all honesty, picking this issue out of the last batch I got for reviews was more or less a “what the hell, give it a shot” decision. While the artwork has always been outstanding, I could never really get into the writing or the characters. Reading this entry in the new story arc, I would like to tip a hat to the creative team of Blake Northcott, Marco Renna, Mark Roslan, and John Starr. They’ve put together a really solid story, populated with some very well-crafted characters. Northcott does a great job with the dialogue, usually one of the hardest obstacles to overcome in writing. The banter between Aspen and her friend Tyler was quick and witty without going too over the top (that’s a very fine line). Other characters each spoke with their own distinctive “voice”, from the conciliatory Siphon, to antagonistic Virydis, to U.S. Army General Somervell who seems a little too eager to obliterate diplomatic relations with the Blue. It seems like everyone serves a purpose in the story, and the characters are all thought out rather than just filler. I also really got a kick out of the use of social media as a driving force behind much of the plot… “chirps” are used in place of the usual narrative boxes, displaying the fickle nature of public opinion and how easily the tide can change (never press “submit” or “send” in anger, folks). 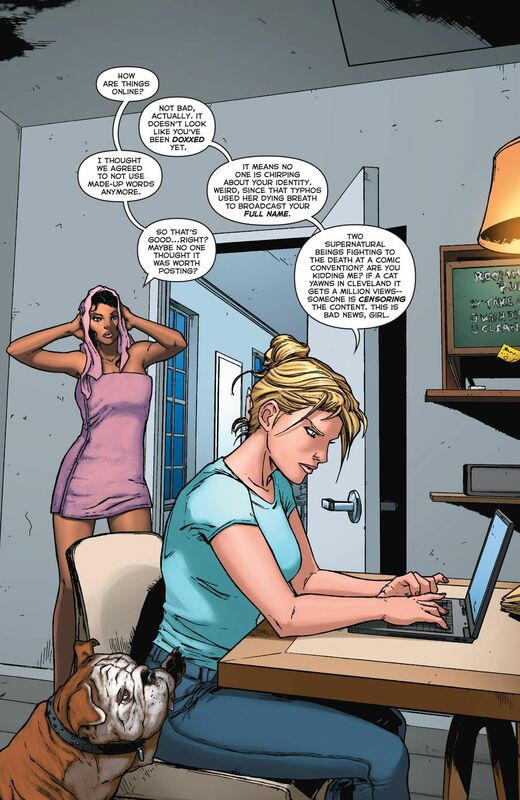 Now, on to the artwork… I will grant that, despite the tendency at times to lean toward cheesecake and eye candy, Michael Turner set a pretty high bar when it came to setting the visual standard for Aspen Comics. His boots are very well worn by the team of Renna, Roslan, and Starr. Everything is detailed and clear, from the characters and their features, to the city of Muria. Even the panting-slobbering bulldog Matilda is portrayed with love and affection. It’s all there, and while Aspen is no doubt spectacularly proportioned, her curves aren’t just there for looks. Gone is the two piece bikini, in favor of the much more practical for underwater action wetsuit. My overall impression of the new and improved Fathom is that this is a title I’d like to dip back into, if for no other reason than just to see where it goes from here. The story has me interested. The character interactions and relations seemed to be held up to the same level as the character designs and the action. If that’s going to be the ongoing standard for this book, Aspen should have a fan favorite on their hands that does more than just set up fodder for a “swimsuit issue”.